John von Neumann was a Hungarian-American mathematician, physicist, and polymath. A child prodigy, by the age of eight he was familiar with calculus and knew Ancient Greek. 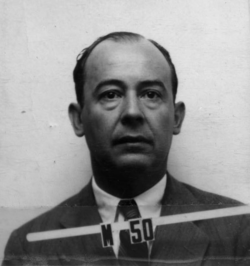 Von Neumann became a naturalized citizen of the US in 1937, while a professor at the Institute for Advanced Study. He joined the Manhattan Project in 1943, working on the immense number of calculations needed to build the atomic bomb. He showed that the implosion design, which would later be used in the Trinity and Fat Man bombs, was likely faster and more efficient than the gun design. Von Neumann's principal contribution to the Project was the concept and design of the explosive lenses used in the implosion bombs. Von Neumann was also included in the target selection committee responsible for choosing the Japanese cities of Hiroshima and Nagasaki as the first targets for the atomic bomb. He oversaw the computations related to the expected size of the bomb blasts, estimated death tolls, and the distance above the ground at which the bombs should be detonated for maximum effect. After the Manhattan Project, von Neumann worked closely with Edward Teller and Klaus Fuchs to solve problems related to the development of the hydrogen bomb. Von Neumann's contributions to science, mathematics, and early computing are countless. His gift for applied mathematics took his works in directions that influenced quantum theory, automata theory, economics, and even defense planning. Von Neumann is considered the father of game theory, which has had a broad influence in fields ranging from economics to evolutionary biology. Von Neumann was also a founding figure in modern computing. He was the first to describe a computer architecture in which the data and the program are both stored in the computer's memory in the same address space. Von Neumann also helped develop the Electronic Numerical Integrator And Computer (ENIAC), the first electronic general-purpose computer. One of its first programs was a study of the feasibility of the hydrogen bomb. Von Neumann's team also performed the world's first numerical weather forcasts on the ENIAC computer. Von Neumann's ability to instantaneously perform complex operations in his head stunned other mathematicians, and his photographic memory allowed him to recall information without hesitation. Nobel Laureate Hans Bethe could not comprehend von Neumann's incredible intellect: "I have sometimes wondered whether a brain like von Neumann's does not indicate a species superior to that of man." 1903 Dec 28th Born in Budapest, Austria-Hungary. 1926 Received Ph.D. in mathematics (with minors in experimental physics and chemistry) from Pázmány Péter University. 1943 Sep 20th Begins work on the physics of implosion at Los Alamos, New Mexico.